Be it a lightning strike that destroys a home entertainment center or consistently fluctuating power that degrades the performance and shortens the life of your electronics - surges, lightning, and other power disturbances can have a devastating impact on the valuable electronics you rely on every day. The P8U2 offers guaranteed surge protection from the most trusted power protection company in the industry, APC by Schneider Electric. Connect and protect up to 8 electronics, and conveniently charge your mobile devices via 2 additional USB ports. Installation is convenient and easy with a 180-degree rotating power cord and right-angle plug. Lastly, two LED indicators inform you if there are any unit and wall wiring issues. As one of the world’s largest and most respected power protection designers and manufacturers, APC is relied upon daily for power protection and availability. APC SurgeArrest products offer the maximum level of protection, safety, convenience, and reliability. The P8U2 uses state-of-the-art circuitry to protect sensitive electronic equipment from dangerous power surges and multiple surge events - even lightning. Its eight outlets and two USB charging ports allow you to power multiple devices simultaneously while keeping them protected during the process. The P8U2 also offers transformer block spacing for four outlets, so you can connect bulky transformers without covering other outlets. 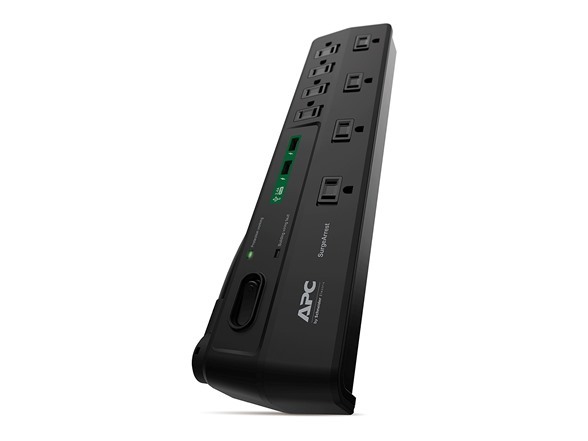 The APC P8U2 has a 180-degree rotating power cord with right-angle plug that enables placement of equipment and furniture close to the wall of your home or office. It also reduces cord stress and extends the life of the power cord and surge protector. The sliding safety shutters on each receptacle protect children and adults from accidental contact with unused outlets. The noise filter of the P8U2 surge protector/charger reduces electromagnetic interference (EMI) and radio frequency interference (RFI) to block unwanted line noise, thus ensuring better performance of protected equipment. It also helps prevent equipment lockup.